The Keeper’s house has been meticulously restored to its 1950’s-era beauty. 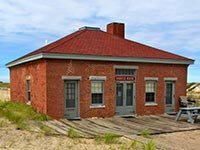 Accommodations for approximately 10 people are available at this historical site - Race Point Lighthouse, located within the Cape Cod National Seashore in Provincetown, Massachusetts. With the atmosphere of a bed and breakfast, you will be able to meet people from across the world at this little piece of heaven! If you have a larger group and would like more space, the entire Keeper's House is also available to book for a more intimate setting. And if solitude is what you have in mind then the Whistle house is the perfect place for you! The building's interior was restored and remodeled in 2007, featuring an open ceiling layout, perfect for allowing the cool ocean air to breeze through the house. This unique house offers privacy for up to eight people and is perfect for your vacation getaway! Both the Keeper's house and the Whistle house offer central heating, electric and hot running water. You will need your own four-wheel drive vehicle if you stay at the Whistle House. Weekly oversand permits are available from the National Park Service. Once acquired, you can drive along the scenic sand dunes and ocean-view trails surrounding Race Point Lighthouse. For Keeper's House guests, volunteer-driven transportation is provided. For additional information and our overnight stay policies, please click here.